Since 2013, BulletSafe has been providing high-quality bulletproof vests at unbeatable prices, to ensure that top-of-the-line protection is available to anyone and everyone who needs it. Now, BulletSafe is extending their commitment to quality and value to a new line of protective products: RiotReady Riot Gear. 1. 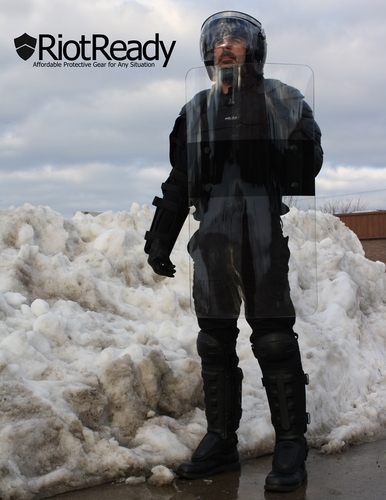 Riot Pads: This set of full-body protective gear includes shoulder pads, inner/outer arm guards, and front and rear leg protectors, which extend from the knees down over the ankles. This set is ideal for protecting your limbs from the impact of swung or thrown objects. These items are durable and twice as thick as normal sports pads, yet still flexible enough to allow a full range of mobility. They come in one size and will comfortably fit wearers up to 225 lbs.. Whereas you might normally expect to pay around $300 for this equipment; the full set of RiotReady Riot Gear has a retail price of $129. 2. Riot Shield: This riot shield is made from heavy-duty polycarbonate and measures 35” x 19.5”, large enough to completely cover and protect most users’ torsos. It is also totally transparent except for the arm bar in the center, so it will not impair your line of vision in situations where clear sight is critical. The arm bar is oriented for right-handed use, but it can be inverted for left-handed use as well. The RiotReady Riot Shield is available for only $99. 3. Riot Helmet: This sturdy helmet was originally designed for use by the Egyptian Military during demonstrations against the country’s government. Now that level of military-grade protection is now available at any budget. The RiotReady Riot Helmet boasts a wide array of features including ear vents for ease of hearing, a neck protector to guard your neck against deflected blows or thrown objects, and a sturdy transparent face shield. RiotReady offers this premium helmet at the unbelievable price of $75. RiotReady Riot Gear and BulletSafe Bulletproof Vests are available at wholesale prices to qualified retailers. Tom Nardone of BulletSafe/RiotReady is available for questions or conversations at 1-248-457-6877. Both RiotReady and BulletSafe products will be available at SHOT Show booth #2616.